in 2011 the trend was to have your mobile phone display have a high resolution and also be big, above 4-inches. Next year it seems the trend will continue on this path, but also be flexible. 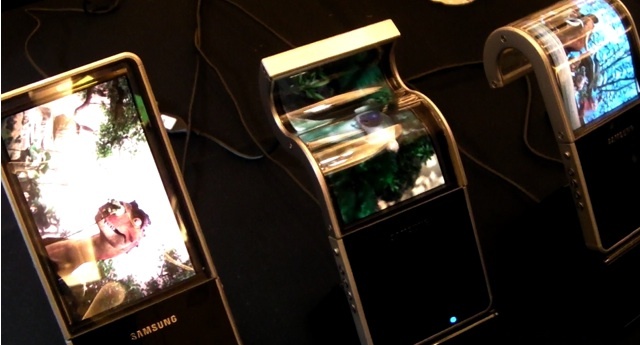 Samsung has been pushing for this for a few years and the last public demonstration of a flexible AMOLED display was at CES 2011 (video below). During Samsung’s Q3 2011 earnings call spokesman Robert Yi went on record and stated “The flexible display, we are looking to introduce sometime in 2012, hopefully the earlier part. The application probably will start from the handset side”. Yi also noted that tablets will eventually follow phones… sounds exciting! Imagine what a 4.5-inch AMOLED, quad-core Android Ice Cream Sandwich device would be like.